Mark your calendars, and join us for our Lenten Parish Mission! 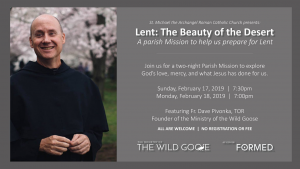 We welcome the Wild Goose – Fr. Dave Pivonka, TOR, for a two-night talk to explore God’s love, mercy, and what Jesus has done for us. Feb. 17th (7:30pm) and 18th (7pm) in the church. Bring a friend, text a neighbor, invite a family member! All are welcome!